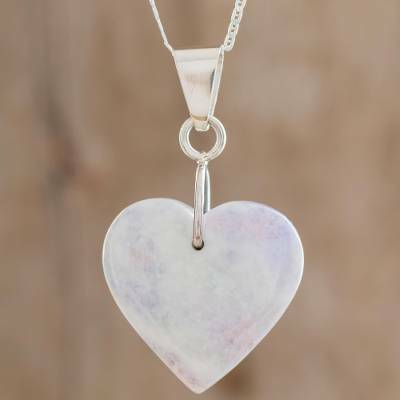 Heart Shaped Sterling Silver Jade Pendant Necklace , "Lilac Green Maya Heart"
Treasured by the ancient Maya as a sacred stone, a jade heart beats with loving elegance. Guatemala's Zandra Lorena Sajbin designs the necklace featuring a reversible lilac and dark green jade heart pendant. It hangs from a glistening sterling silver chain. Lilac jade is a natural stone. Its color will vary due to its white, green, blue and rose veins. You can find jade heart necklace 'Lilac Green Maya Heart' by Zandra Lorena Sajbin in jewelry categories such as Heart Shaped Necklaces, Jade Necklaces, Silver Necklaces, Sterling Silver Necklaces and Pendant Necklaces. Enjoy exploring these sections for other Novica treasures.